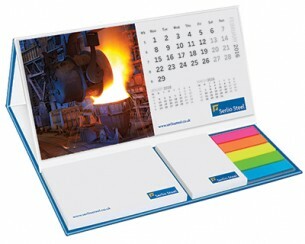 A fantastic all-in-one desk stationery set, the printed Calendarpod is a great option for your next giveaway. If your customers or clients work in offices, they will love using this item, which combines an A7 and A8 50-sheet sticky note pad, five index tabs with 25 sheets each, and 12 calendar sheets with a month to view. It stands on its own, and it's perfect for secretaries or anyone else who needs to check the date frequently. The item comes printed with your decoration via litho or digital printing.